"Tropical Isle" Feather Lite ™ Carpet & Vacuum Freshener - 7 oz. 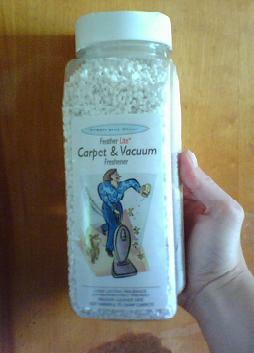 Home > Vacuum Cleaner Scents / Shampoo > "Tropical Isle" Feather Lite ™ Carpet & Vacuum Freshener - 7 oz. Feather Lite ™ Carpet & Vacuum Freshener will delight your senses with the cool scent of a Tropical Isle. Sprinkle this light, snow-like powder on dry carpets or rugs, whenever and wherever you need to deodorize. 7oz carton. Environmentally friendly! Freshens: Carpets, Upholstery, Car Interiors, and Vacuum Cleaners. Destroys: Pet Odors, Tobacco Odors, Mold & Mildew Odors, Fireplace Odors, and Cooking Odors! home | | Shopping Cart | Privacy and Transparency Policy | | Site Map | | Contact UsA-Z VacuumBags.com LLC, #1 Online Source for Vacuum Cleaner Bags, Belts & Filters, Bagless Vacuum Cleaner Filters & Belts - Copyright © 1997 - 2019 - All rights reserved.